It was a typical hot, balmy day when protesters supporting Sarath Fonseka, the retired general and defeated presidential candidate now under arrest and facing court-martial, gathered near the Supreme Court complex in the capital, Colombo, on Wednesday. Trouble was in the air. Another group was mingling near the statue of former President Ranasinghe Premadasa, holding posters of President Mahinda Rajapaksa. The opposition had scheduled a protest near the statue  the first of many, according to organizers  demanding the release of Fonseka. Police, some in riot gear and with water cannons at the ready, stationed themselves between the two groups to prevent a clash. 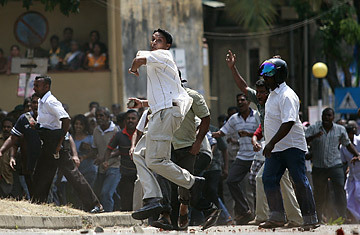 As the Fonseka supporters moved near the yellow barricades set up by the police, their shouts grew louder. They pushed, they shoved, and they pleaded with police to let them pass. The pleading and shouting went on for a bit, while 100 meters away, on a small grassy knoll, another crowd gathered, armed with stones, bottles and sticks. The groups eyed each other ominously until the pro-Fonseka crowd grew in number and in noise and pushed the barricade down. The pro-Fonseka activists marched toward the knoll, and stones, bottles and sticks began flying first at them and then from them as clashes erupted between the two groups. Fonseka was arrested by military police at his home in Colombo on the night of Feb. 8 on charges of plotting to overthrow the government while still in service, harboring army deserters, and corruption. The arrest was the culmination of two weeks of tension and charge-trading between the government and Fonseka camps. On Jan. 26, hundreds of armed troops surrounded Fonseka and his team inside a five-star hotel in Colombo on the eve of the election. The government has declined to disclose where the general is being held, citing security reasons, though his family and lawyers have been given access to him, according to the Media Minister. Windscreens on police vehicles were shattered by large stones. Numbers on their side, the Fonseka supporters started chasing their attackers through narrow alleyways of the city center, while high-ranking police officers gave orders to launch water cannons and teargas. By about noon, the main road leading to the country's highest court resembled a small battlefield. The thuds of gas rifles echoed through the government housing complex nearby as police tried to stop Fonseka supporters in their chase. The clashes left eight injured, though none seriously. In the end, a crowd of some 2,500 Fonseka supporters converged in front of the court complex, joined by leaders of opposition parties and Anoma Fonseka, wife of the general. During her husband's run for the presidency, Anoma made few appearances on the stump, but since his arrest, she has come to foreground. A day after his arrest, she tearfully met with the media. "Why is he treated like this?" she asked tearfully. "He is a war hero, and now he is in jail." Fonseka's 40-year career culminated in the defeat of the Liberation Tigers of Tamil Eelam in May 2009, which brought to an end the bloody separatist war of more than 2½ decades. On Wednesday Anoma was more composed, drawing the largest and loudest cheers from the crowd. "These protesters have come here without us forcing them," opposition parliamentarian Mangala Samaraweera told TIME. "The fight for democracy is not dead." The opposition leaders surrounding the general's wife also vowed to continue to protest his arrest. "This is just the beginning. We will not stop until justice is done," said Somawansha Amarasinghe, leader of the People's Liberation Front, a prominent opposition party that supported Fonseka in his campaign. The government has maintained that the general was taken into custody in accordance with correct procedure. Under Army Act section 57, any retired officer or soldier is considered a military officer for six months (after retirement), Media Minister Lakshman Yapa Abeyawardena told reporters today. Fonseka retired from the post of Chief of Defense Staff on Nov. 12. The government minister also warned that until court proceedings are concluded, any public expression of opinion about the matter is prohibited. "The opposition is trying to get innocent civilians onto the streets to achieve their political ends. They should not put innocent lives at risk," he said. Lawyers representing Fonseka are planning to petition the Supreme Court challenging his arrest and seeking a decision declaring the poll null and void, Tissa Attanayake, the general secretary of the United National Party said. The opposition has already raised objections to the elections commissioner over vote rigging, but commissioner Dayananda Dissanayake has since declared the elections, which President Rajapaksa won by a majority of 1.8 million votes, as fair. One protest, however fiery, is unlikely set off any tremors. Colombo was back to business soon after the protest was over. The traffic was once again bad, the buses were belching, and the heat unbearable. Die-hard Fonseka supporters have vowed to continue the protests, which have yet to gain the support of wider civil-society groups. "We will go on. We will not stop till our general is given back to us," Vinni Siegera, a middle-aged woman who had attended the rally without an invitation, told TIME, beads of sweat on her forehead. The next few days will make it clear whether those like her have wider support in the country.